Dimensions 2 by 6.75 by 8.50 in. Amazon.com description: Product Description: This is a high-quality, hardbound edition of the official GNU Emacs Lisp Reference Manual, from the current Emacs Version 24.5 distribution. It is printed on acid free and lignin free paper, that meets all ANSI standards for archival quality paper. 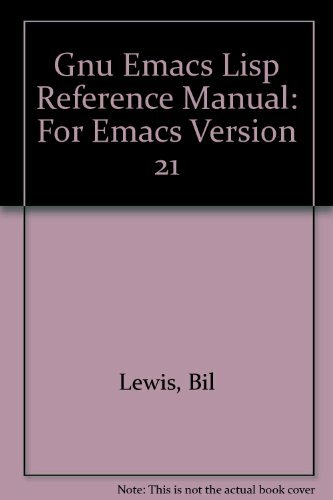 *** The GNU Emacs Lisp Reference Manual is also available for free within GNU Emacs itself, via the help system, or online. Professional users may find this hardbound edition convenient for frequent consultation, and an excellent copy for desktop reference. *** For each copy of this manual sold, 10% of its gross sale revenue is donated to the Free Software Foundation (FSF). About: This is a high-quality, hardbound edition of the official GNU Emacs Lisp Reference Manual, from the current Emacs Version 24.